Place potatoes and 1 teaspoon salt in a saucepan; cover with water. Bring to a boil; cook 5-6 minutes more or until just fork tender. Remove from heat. Drain. 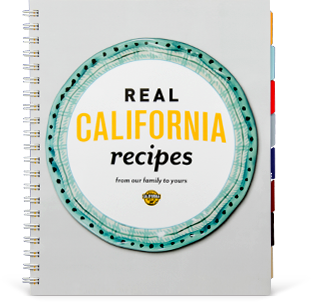 Place 2 cups corn kernels in blender with one container Real California Greek yogurt, blend until smooth. Melt 1 tablespoon butter in large sauce pan or chowder pot. Add chopped onions, herbamare and thyme. Sauté until soft, 3-4 minutes. 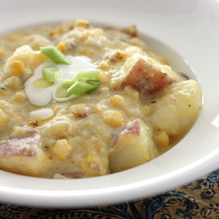 Stir in potatoes, remaining corn, pureed corn, nutmeg, and Real California milk; bring to a boil. Reduce heat; simmer 10-20 minutes, stirring occasionally. When serving, garnish with Real California Crème Fraîche and scallions.